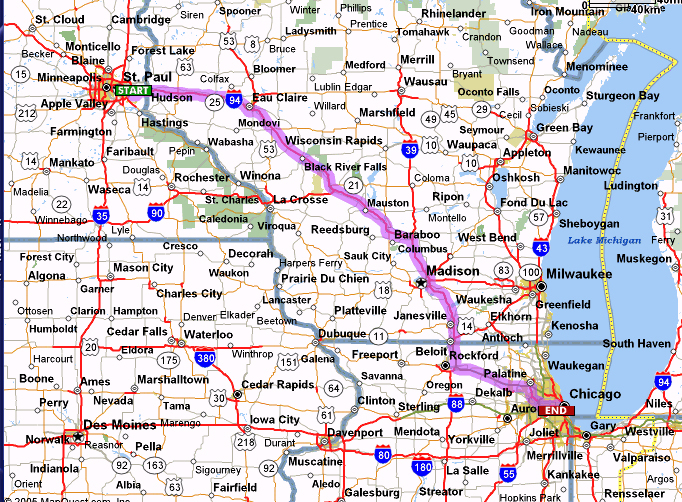 Here is our route to Chicago. 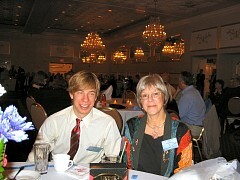 We were invited guests at the U.S.S. 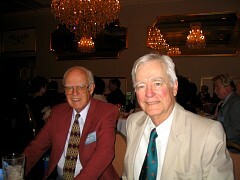 William M. Wood ship reunion held in Oak Brook Illinois. This drive took us about 3 1/2 hours and we made it over two days - stopping for the night at Mauston. My companions for the trip. 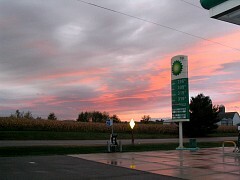 We stoppped for gas past Eau Claire as darkness falls. 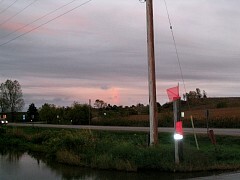 There is a funny kind of rainbow in the sky that you can see in the rightmost picture. 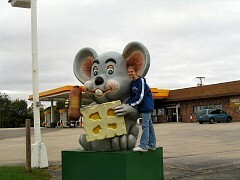 Distracted by the camera, Megs steals the cheeze of this large Wisconsin mouse. 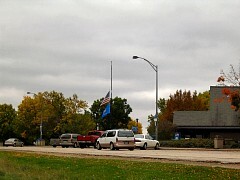 We pulled off of I94 to this rest stop - I think the flag is at half mast for the death of U.S. Supreme Court Chief Justice William Renquist. 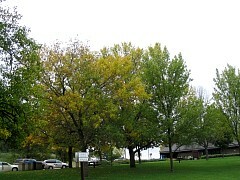 It's early fall in central Wisconsin and the trees have barely turned color. 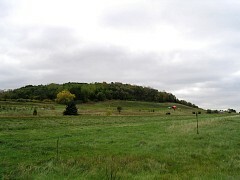 The trip along I94 is very scenic, hilly country with the occasional scenic bluff. Look on the next webpage to see a picturesque balanced rock outcrop. 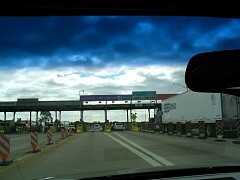 Here we are arriving at the first of probably six toll stops we hit as we proceed into Chicago. Bring lots of change with you - on the way home we encountered a pickup next to us that ran out of change at the last toll - we flipped them a dollar coin for our good deed. Regulars can use special cards that automatically pay the toll as the car drives past. Some toll stops have humans at a few of the booths in case you need to pay with currency. 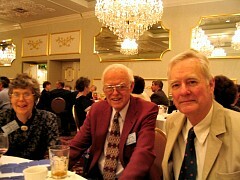 My companions at the hotel where the ship reunion is held.